1947 CD classic years. 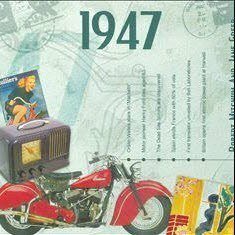 This unique two-fold greeting card features fabulous iconic imagery along with news headlines which will undoubtedly bring back many memories of 1947. The CD Card includes a 20-track compact disc. 1. Frank Sinatra - I Believe. 2. Coleman Hawkins - Angel Face. 3. Count Basie - Shine On Harvest Moon. 4. Dizzy Gillespie - Two Bass Hit. 5. Louis Armstrong - Pennies From Heaven. 6. Erroll Garner - Erroll´s Bounce. 7. Roy Acuff - Blue Eyes Cryin´ In The Rain. 8. Oscar Peterson - Poor Butterfly. 9. Buddy Clark - Ballerina. 10. Duke Ellington - I Can´t Believe That You´re In Love With Me. 11. Floyd Tillman - I Love You So Much It Hurts. 12. Bill Monroe & His Bluegrass Boys - Molly & Tenbrooks. 13. Lucky Thompson & His Lucky 7 - Boppin´ The Blues. 14. Coleman Hawkins - I Love You. 15. Lennie Tristano - I Don´t Stand A Ghost Of A Chance. 16. Count Basie - Robin´s Nest. 17. Mildred Bailey - That Ain´t Right. 18. Dizzy Gillespie - Good Bait. 19. Roy Acuff - I Saw The Light. that features an all new music selection with many of the top artists and biggest hits of the Year. An ideal card and gift in one for birthdays, anniversaries or any Special day. Please see below for the full track listing of the 1947 CD.